Since the publication of the first edition 15 years ago, vascular surgery has been transformed into a new specialty incorporating endovascular surgery and techniques. These innovations are detailed in this much anticipated second edition. 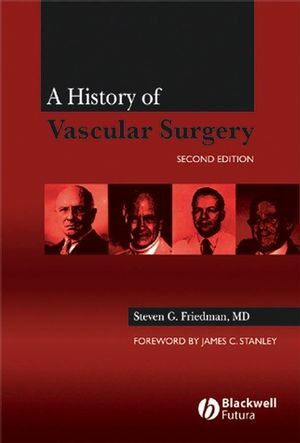 Like the first edition, this new edition of A History of Vascular Surgery paints engaging portraits of the surgeons and scientists whose ideas and practices underlie, and continue to influence, vascular surgery as we know it today. Written for the practitioner and student alike, the second edition provides an in-depth, accessible history of this rapidly changing field. Steven G. Friedman, MD is Assistant Professor of Clinical Surgery at North Shore University Hospital and Cornell University Medical College. He is attending Surgeon at: North Shore University Hospital, Manhasset, New York; Booth Memorial Medical Center, Flushing, New York; and Long Island Jewish Medical Center, New Hyde Park, New York.